Two or three Thanksgivings ago I railed (as I often do) at the lack of imaginative and good-looking (both aesthetically and nutritionally) vegetarian offerings for Thanksgiving main dishes. I wasn’t having a whole lot of luck being impressed by what I saw in the newsstand food glam magazines, vegetarian and vegan cookbooks, food blogs, my local newspaper food section, or even the freezer section of my local Whole Foods. So I came up with a list of suggestions for vegetarian centerpiece dishes. This year, we had the double-double challenge: Thanksgiving fell on the first day (though only the second evening) of Chanukah for the first time in over 100 years (1860s was the last time?) and won’t again for another 77,000 or so (well, some sources say there’ll be another Thanksgivukkah moment in about another 100 years and then the big schlep out to 77K. Either way, for most of us, this is “that moment”). For me, mashing up Thanksgiving and Chanukah just this once gives us some ideas for rethinking the kneejerk popular way of celebrating the big important holidays in general. Maybe even exploring what’s so vital about holidays and family and clearing away some of the thoughtless excesses. Chanukah came so early this year that we had nearly no chance at buying or making tons of presents before having to schlep ourselves up the I5 to my in-laws’, so none of us was expecting anything but silly socks, a paperback or so, and maybe a stop in Solvang for Danish marzipan-based sweets on the way back home. That’s all to the good–Chanukah was never really meant to be a “more presents all the time” kind of holiday, it’s about freedom of religion, freedom from outside oppression, and gratitude for the miracle of having enough resources to go around. Thanksgiving is about those things too. It’s just a matter of practice. And a willingness to channel Sylvia (one of my favorite cartoon characters, by the great Nicole Hollander). My sisters-in-law from Oakland were planning a visit to us this summer now that we actually have a house and can host them. It fell through, but the prospect got me thinking about vegan food and what we might serve them. They’re both good cooks, but they eat a lot of commercially-prepared vegan meat substitutes along with their own fresh vegetables and grains and baked goods. I’m not great on packaged foods in general, and unfortunately, vegan proteins other than plain fresh tofu and dried beans look an awful lot like vegetarian versions of Oscar Meyer sliced bologna and turkey loaf to me. Not just the appearance, but the cost per serving (really high–something like 4-6 bucks for a chic little package that serves two, ostensibly) and the salt (also really high–600 mg and up per serving). And the ingredients lists are always long and kind of mysterious-sounding, either in a surprisingly chemical way or in a Japanese-ingredient-names-as-authenticity way. Not that I’m not working to figure out exactly what kombu and dulse and Job’s tears are. Two seaweeds and a resin? I think, anyway. There’s also a lot of yeast extract in some of these processed vegan proteins–sounds like between that and the salt, what they really did was dump in Vegemite or Marmite. Bleagh (my husband’s sister is kind of an Anglophile, but that doesn’t excuse either version to me). On the other hand, some of the vegan cookbooks out now have do-it-yourself recipes for seitan, and so do Ellen’s Kitchen and FatFree Vegan Kitchen. Why is this worth doing if you don’t eat vegan and aren’t actually having vegan guests in the house after all? (and now that I’ve schlepped the last of the moving boxes out of the living room, I’m really wondering). I think back to my favorite Chinese restaurant back east, the Hunan Manor in Columbia, MD. Every time we fly back east we try to make a stop there. One of the things that makes the Hunan Manor great is their willingness to experiment and invent. They serve a wide variety of vegetarian versions of standard banquet dishes using “vegetarian chicken”–basically seitan cut and fried as for meat. These dishes complement their masterful use of tofu with textures from nearly silken to deep-fried to pressed and diced for the vegetarian jao tse, which I’ve always thought looked better and probably tasted better than the pork-based meatball filling our nonkosher friends would get (though they raved about them, and I’ll take their word for it). The last time we came east, the restaurant had added several new dishes using a different form of seitan with very finely layered rolls that were cut in bite sized pieces, coated and fried–a pretty close simulation for the layered flesh of chicken. It was really delicious in their orange “chicken” with perfectly cooked bright green broccoli. It was unexpectedly unsalty as well, so I don’t know whether they made it in-house or had bought the prepared seitan in an unflavored form. Either way, the dish was a great argument for using seitan creatively, and I don’t think my sisters-in-law, competent cooks though they are, have eaten any seitan dishes that good using anything from a little Gardein package. Puzzling out the personal life of a famous food critic can be hazardous to your cherished impressions. I’ve just tripped over (I’m still not technically savvy enough to have “Stumbled Upon”) Regina Schrambling’s blog gastropoda.com, and it’s a little too revealing. Schrambling recently ended a five-year stint writing a food column for the LA Times, probably (though I’m not certain) in the aftermath of the newspaper gutting its departments and letting scores of award-winning journalists go. If Schrambling’s column was adamantly butter-laden (and it was), it was also thought-provoking, ecumenical and wide-ranging. Civil in an intelligent way about all kinds of food. She’s more famous than that, of course–a former editor of the more prestigious NY Times Dining section, and now a guest blogger for epicurious.com’s The Epi Log, with a focus on frugality. But the LA Times articles are where I knew her from. So Gastropoda is a bit of a shock. It’s a blog with book reviews, short restaurant reviews, all the usual authory showcase kinds of links. But most of all, it’s a blog with quite a run of very short, very pungent entries that are almost too personal in their thinly cloaked vitriol. The editor of the Epi Log introduced Schrambling by calling Gastropoda witty and “famously acerbic”, but I think that’s putting it mildly, and perhaps even charitably. Targets include celebrity chefs who not only don’t write their own cookbooks but don’t ever even test the recipes that have been packaged into them by committee. News publishers who’ve sacked their veteran columnists in favor of wet-behind-the-ears food reviewers with no sense of journalistic ethics. Government officials who can be bought at an astonishingly low and low-class price. It’s not that I don’t frequently agree with the basic points she’s making on Gastropoda. But in large part I’m embarrassed. The nicknames she provides her targets to avoid direct libel are childish in the extreme (e.g., “Chimpie” for George W. Bush, “The Drivelist” for a popular and successful NY Times food writer). Sometimes they’re too veiled and cryptic and make it hard to figure out who exactly she’s lambasting in these convoluted attacks. Not that I’m curious, of course. Mark Bittman’s post-Thanksgiving look into the brave new world of absorption pasta and Pete Wells’s “Cooking with Dexter” piece in the New York Times yesterday on the virtues of a pot of boiling water have me thinking hard about why neither of them has even tried the microwaves that must be sitting on their counters. Especially Wells, who has not one but two very young and active children to watch out for. 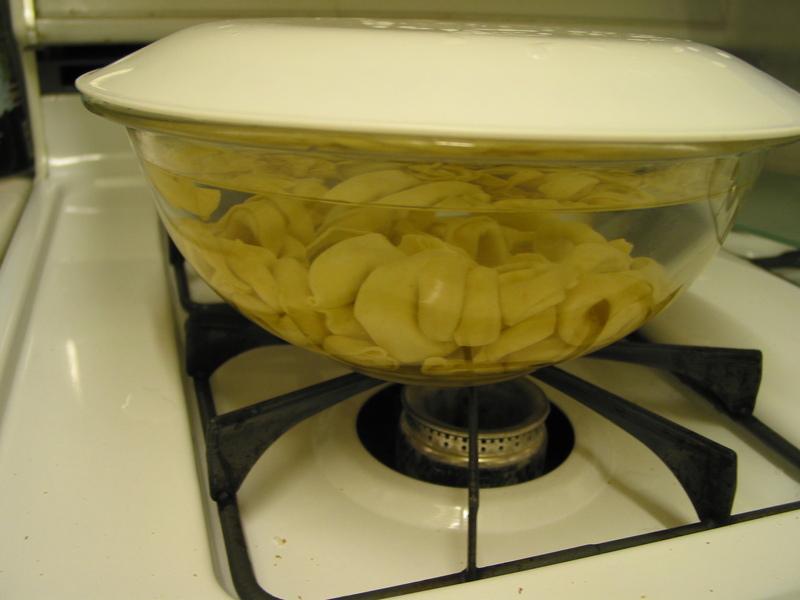 You can cook standard dried or frozen pasta very well in a microwave, with only a few minutes of actual cooking time and almost no need to stay close by. You can cook rice too–and we’re not talking Minute Rice, either. Basmati rice, the queen of difficult rices, cooks perfectly in a microwave. The past week has seen a number of shock waves go through the food world. Gourmet magazine’s announced closing yesterday is the latest and the one with the best PR. Gourmet‘s editor, Ruth Reichl, has turned what was once the flagship publication of foodie-ism into something more like Vogue for food–high-gloss, decorator restaurant food (the focus of her previous career) with recipes that ranged from routine to fanciful, from decadent but enticing to over-the-top, impractical, even wasteful and ridiculous, particularly in the last couple of years. A few memorable examples of the latter–lamb cooked with a stewing sauce that included something like a cup of whole coffee beans in an ingredient list some 20 or so items long, a chicken liver paté with a ton of added butter to simulate foie gras when that dish was outlawed in Chicago, and a chocolate and sesame butter tart with so many elaborate steps and so much extra fat in each layer–with nearly obvious clashes of flavor–you could practically choke. Reichl, whose memoirs I have nonetheless enjoyed a great deal, seems to have been in on the official food world’s migration to recipe titles–and restaurant menu listings–so long they owe more to Proust, or perhaps Balzac, than to James Beard. Then again, Proust called madeleines madeleines, not “little ridged pure butter genoise microcakes with microplaned lime rind, baked in the shape of elongated shallow clamshells”. Goodness knows what today’s foodie superstar chefs would come up with for a title. And yet Gourmet, with its glossy ads for show kitchens and olive oils and edible vacations in exotic locales, has tried to broaden readers’ ideas and ideals on occasion, and that’s Reichl’s influence too. If the cover one month showed coveted seating at a prestigious Paris restaurant, the tablecloth and glassware sternly hushed in preparation for the pre-theater crowd, or the cliffside view of an Italian trattoria table with a glass bowl in the foreground brimming voluptuously with prawns, greens, oysters and a coral-hued or purplish octopus, other issues sent staff into the mountainous inner reaches of China to report on the poverty and generosity of villagers there. It’s hard to imagine how Reichl and her staff pictured reconciling the ultra-affluent with the world-conscious, and perhaps their attempts failed to convince either luxe advertisers or Condé Nast this year in particular. But I can see how Gourmet‘s underlying spirit of foodie-ism has led to the explosion of adventurous, hands-on food blogs of a younger working generation as they discover both real food and the desire to learn to cook it. But Gourmet isn’t the most important food barometer, particularly because it represents a shrinking target audience at the top of the food chain, as it were. Rumbles farther down the scale have been quieter but with any luck perhaps one hopeful sign will be more lasting and more influential. Last Thursday, the L.A. Times reported that the federal WIC (Women, Infants and Children) food supplement program will now allow participants to spend their vouchers on fresh produce and whole grains. The allowance isn’t really big– $6/month per eligible child, $8 per pregnant woman or mother of a child under 5, and $10 per nursing mother, or about $14/month on average for a typical family, but it’s a start. More promising is that the changes would push stores that want to accept WIC vouchers to stock fresh produce and whole grains. That might put at least modest quantities of decent foods within reach in lots of inner city neighborhoods, and it means farmers’ markets can also start qualifying to accept vouchers. In the Los Angeles area and Orange County, the WIC program is especially important–out of more than 12 million people, something like 316,000 low-income people are enrolled in WIC. More than 8 million people are enrolled nationwide at a cost of slightly under $7 billion per year, with vouchers of about $60 total per family per month. Less than $1000 per family per year even counting the administrative costs of the program. It makes the Food Stamp program seem generous by comparison. The new shift toward allowing fruits, vegetables, and whole grains under WIC isn’t adding anything to the total Congress allots–the cost for these vouchers has been taken from some of the dairy and juice allowance. But local WIC officers are still grateful and think it’ll make a big difference to their clients, some of whose children have never tasted fresh broccoli. It’s a far cry from the fuss over the blight on homegrown heirloom tomatoes in the northeastern states this summer. One very strange description crops up in nearly every expert’s take on processed food and the way it’s overtaken fresh and whole foods in the American diet. Everyone from food industry veteran Hank Cardello (see the Stuffed book review) to NYU nutrition professor Marion Nestle in What to Eat talks about fast food and junk food as “tasty”. David Kessler goes even further: in The End of Overeating, he adds “irresistible,” which he says is the problem he faced most of his life. Tasty. It’s the word of champions, the key, the adword to beat. And for the life of me, I’m not sure why. Because the words I would have chosen for most of it include stodgy, greasy, cardboardy, screamingly salty, day-glo ™ orange, and “a lot like airplane food, only on the ground.” Am I the only one? But “tasty”–specifically that word–is clearly the accepted description, even among these food experts, and that points to a host of disturbing assumptions. Either they mean they find processed food tasty or they mean they think everyone else finds it tasty and irresistible–even if there’s something better to eat. That’s kind of defeatist, isn’t it? If everyone “knows” fast food is tastier than fresh produce, what hope is there for mainstream Americans to eat healthier than they do today? What do they actually mean by “tasty” in the case of processed food? They don’t mean fresh, as in fresh produce. They don’t mean tangy, as in yogurt or a tangerine, or sharp as in horseradish or cheddar. Certainly not aromatic, like dill or fennel or rosemary or sage. Or rich and funky and thought-provoking, like aged camembert or shiitakes or asparagus or toasted sesame oil. And they don’t mean complex and savory and surprising, as in a palak paneer punctuated by smoky black cardamom pods, Armenian string cheese with nigella seed, or a long-cooked carbonnade or daube of beef with some cloves thrown in on a whim. Most of the food experts who’ve posited that processed food is “tasty” in their books and articles are older than I am by about 10 years, old enough to remember eating late-July nectarines that devastatingly fragrant, backyard tomatoes earthily ripe and pungent, foods utterly unlike what’s available even in the produce section of most chain supermarkets today. So I can’t help thinking that their casual use of the word “tasty” reflects and even perpetuates the hopelessly tattered, stunted and inexperienced taste imagination of the masses of people who don’t cook for themselves anymore and have given over completely to packaged food, with its excesses of salt and its bland, stale cardboardy background flavor. The ugly assumption they’ve bought into is that people who eat mostly processed food can’t change, won’t change, and most importantly, wouldn’t like fresh food if they tasted it.